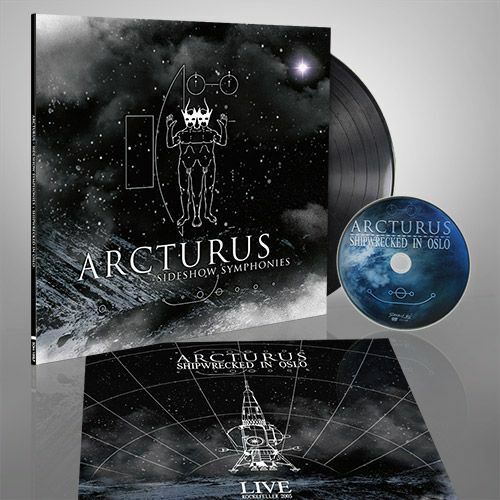 ARCTURUS - SIDESHOW SYMPHONIES VINYL RE-ISSUE (LP BLACK+DVD) | Online Shop | Wizard LTD. Album: "SIDESHOW SYMPHONIES VINYL RE-ISSUE (LP BLACK+DVD)"
Originally thought of as simply a black metal super group, Norway’s ARCTURUS, had the guts to incorporate traditional melody, keyboards, vocal experimental and melodrama into their sinister theatrics. In 2005, with their fourth full-length album ‘Sideshow Symphonies’, they became the premiere progressive, avant-garde art band. The tour that followed was immortalised in September of the same year, when the band’s show at Rockefeller Music Hall in Oslo, Norway was filmed by a professional film crew. Long sold-out separately, this DVD is now available again, packed together with the CD of the album for the price of a regular CD.